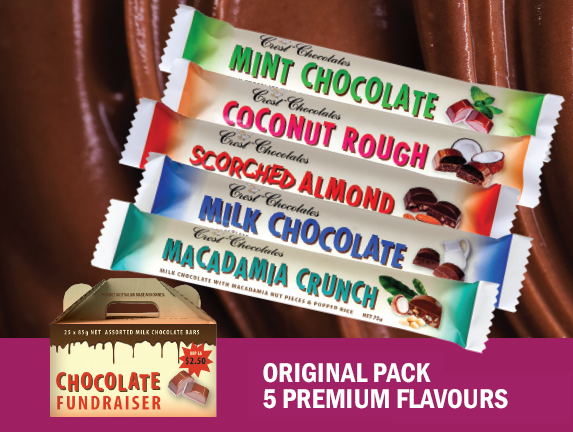 Crest Chocolates have a great assortment of $1.00 RRP and $2.50 RRP chocolate bars for your next chocolate fundraising drive. Crest premium assorted chocolate bars are great chocolate fundraising ideas because they are not sold in the retail stores. Why? So that they can’t be discounted by the supermarket chains just when your fundraiser commences. At Crest Chocolates we take pride in our products and know that you will be delighted with our delicious fundraising range. Our chocolate factory has a food safety accreditation audited by SGS Australia. If your questions aren’t answered in the FAQ area please contact us. Not sure how to select the best fundrasier for your school or group? We are here to help – please take a moment to get in touch and we can discuss the best solution that will work the hardest for your fundraising project. 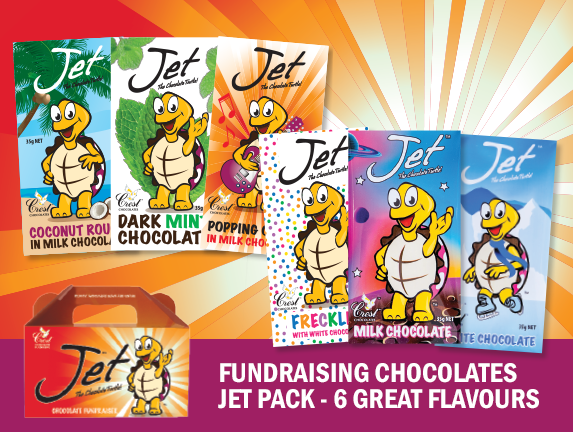 The $1.00 RRP 35g Crest Jet the Chocolate Turtle Bars are another profitable and popular favourite. The six flavours are pre-mixed in the carry packs boxes to save you time and effort and it makes selling easy. 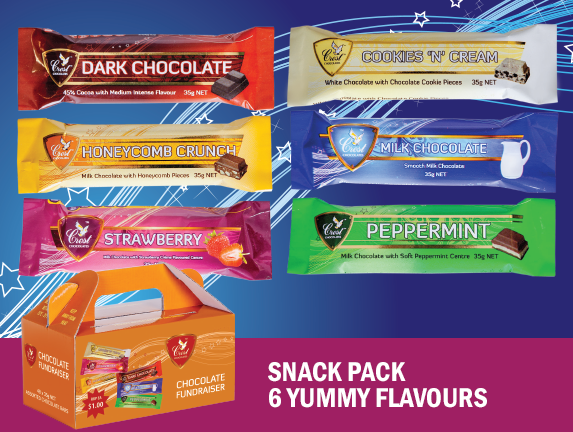 The $1.00 RRP 35g Crest Snack chocolate bars are another profitable and popular favourite. The six flavours are pre-mixed in the carry packs boxes to save you time and effort and it makes selling easy. Unlike other brands, Crest chocolates are not available in retail stores so you sell more. Each carry pack is PRE-MIXED for your convenience. Crest Chocolates is Australian made and owned. The $2.50 RRP 75g Crest chocolate bars are a proven performer – and most profitable. They’re easy to sell!